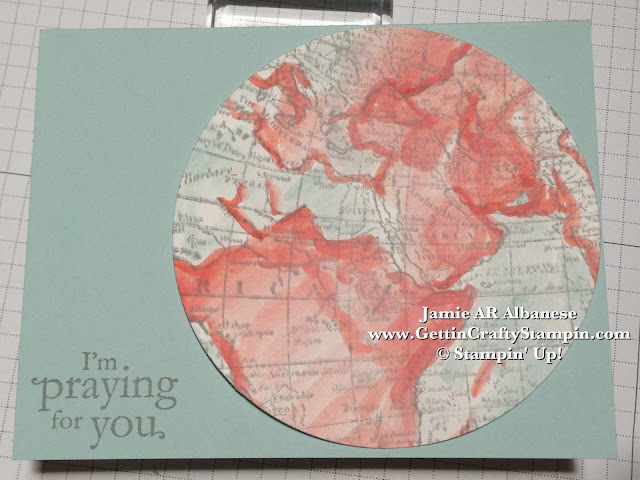 Getting Crafty with Jamie: World Card Making Day Card! World Card Making Day Card! 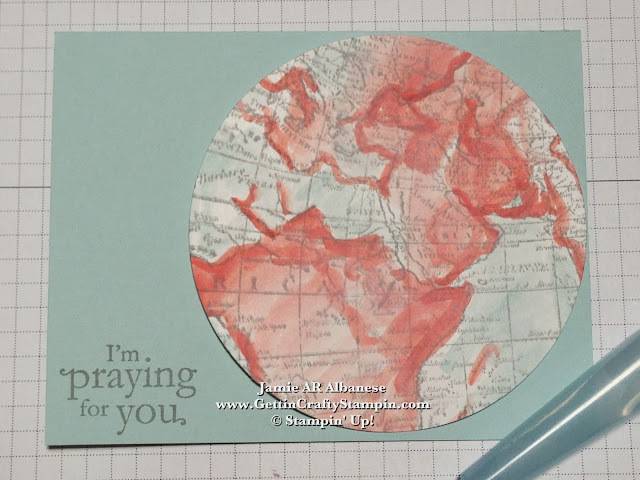 Join me as we travel the world... or just Celebrate World Card Making Day with this World Card!! We had fun creating this unique card that will be shipped around the world... to Soldiers who are Serving Abroad. What do you think? Leave me a comment and let me know. Share this and me with a Pin, Email, Facebook, Tweet, Google+ and Follow Me on these avenues (YouTube, LinkedIn, Instagram, too!). 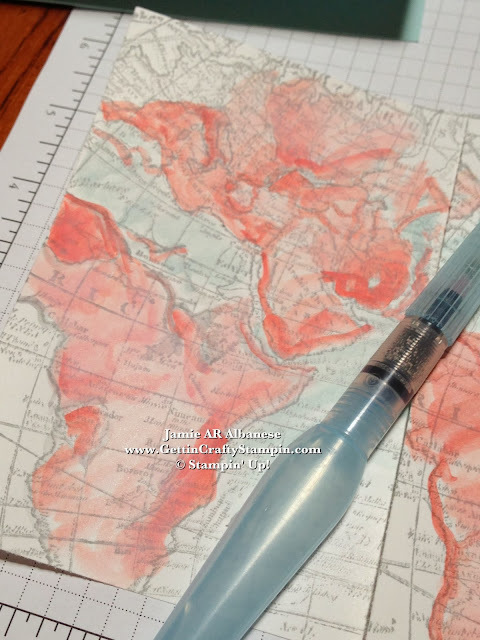 My super hero Color Coach pairs up Smokey Slate with Calypso Coral and Soft Sky... as we created this spin on the fun World Map background stamp (#130345). 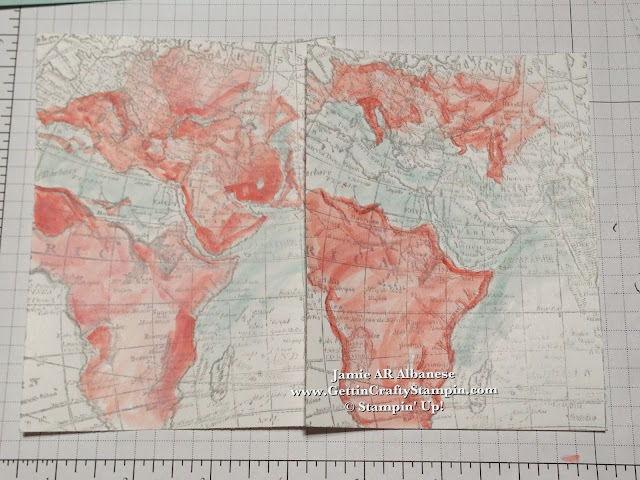 Take a trip around world with me as we create this fun card! 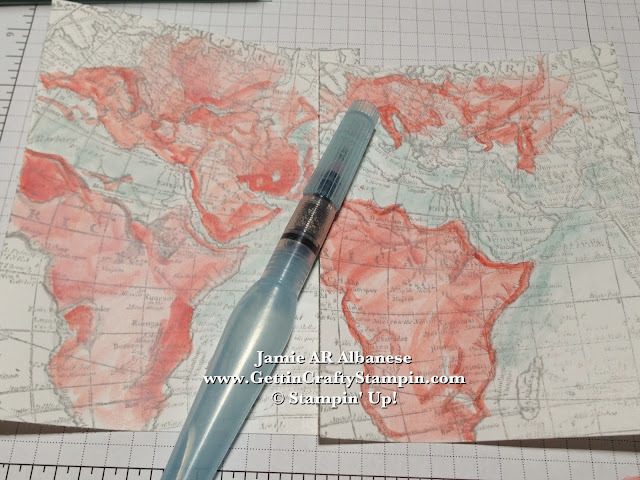 Stamping the World Map background stamp with Smoky Slate ink (#131179) on Whisper White card stock (#100730). Taking my Aqua Painter (#103954) and Calypso Coral ink (#126983) and Soft Sky ink (#131181). Placing a darker line near the edges of places and 'pulling color' into the area for a vintage look is fun and easy to do! The Aqua Painter creates an image that is soft - much like a Water Color artist!! The Soft Sky ink really fades.. it will pop when layered over the Soft Sky card stock (#131181). Because it's loose-goosey you can really highlight parts of this stamped image. I'm pretty sure I colored in bodies of water to be like land, lol. The fun thing is that no one will really look that intently at it. 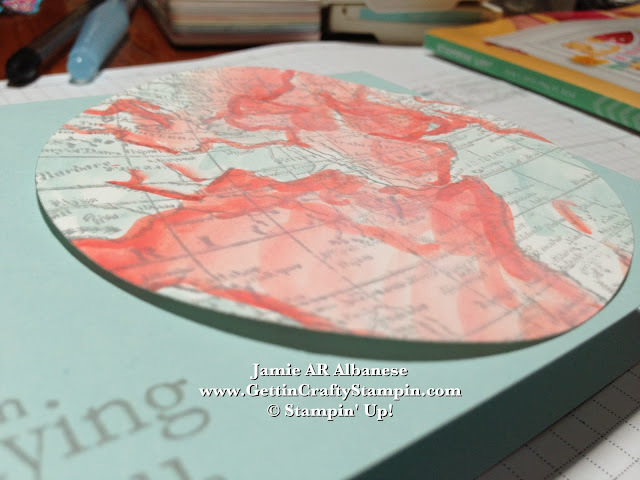 Using my Big Shot Die-Cutting Machine*(113439) and Big Shot Magnetic Platform* (#130658) with my Circles Collection Framelits* (#130911) to morph the map into a globe. *Take the Big Shot and it's accessories home in the Big Shot CLUB! Want the Big Shot for FREE (or any item in the catalog) for Free or 1/2 Off as a Hostess!! The Aqua Painter does have water in the handle. The image takes on a moving look as the edges lift. Our Stampin' Dimensional Adhesive (#104430) raises the image and allows for this free flowing look. Travel the path unexpected!! Take what was one thing and transform it into something new and FUN! Happy World Card Making Day! I hope that this card, created for the event and sending out to Soldiers who are Serving Abroad, warms your heart. Where will this card go?!?! Who knows! !